Seepage Deformation and Slope Stability ofSuspended Rivers in Mainland China, at HKU, on February 12, 2001. Theory and Method of Preferred Plane Analysis for Rock Slopes, at GEO,on February 15, 2001. 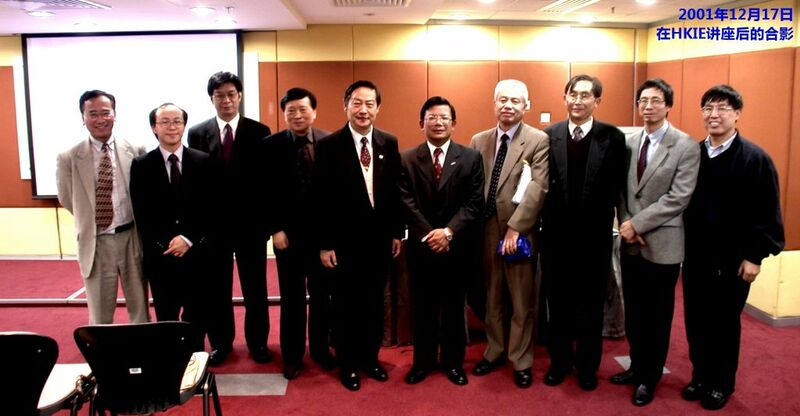 Development and Prospect of Engineering Geology in Mainland China, at HKIE, on February 16, 2001. Stability Analysis and Optimal Anchoring Design forLianziya Huge Unstable Rock Mass on the Bank of the Yangtze River at the Three Gorges, at HKU, on February 12, 2001. Major Geohazards And Their Prevention in the Resettlement Regions adjacent the Three Gorges Reservoir of the Yangtze River,China, at GEO, on February 15, 2001. Engineering Practice of Landslide Prevention in Mainland China: A Review from 1990 to 2000, at HKIE, on February 16, 2001. Spread Application and Recent Development of the Cable Anchor Support Techniques for Mountain Slope Engineering, at HKU, on May 7, 2001. Spread Application and Recent Development of the Cable Anchor Support Techniques for Mountain Slope Engineering, at GEO, on May 11, 2001. Recent Development of Soil Nail Techniques forStabilization of Slopes and Foundation Pits in Mainland China, at HKIE, on May 10, 2001. Investigation of the Dangerous Conditions forGeotechnical Works in Xuzhou and the Flow-convex Failure Model, at HKU, on May 7, 2001. Collapse of a Deep Foundation Pit in Guangzhou – ALesson Learned, at GEO, on May 11, 2001. Basic Features of Karst Development and Karst Collapse Hazards, at HKU, on September 11, 2001. Basic Features of Karst Development and Karst Collapse Hazards, at GEO, on September 14, 2001. 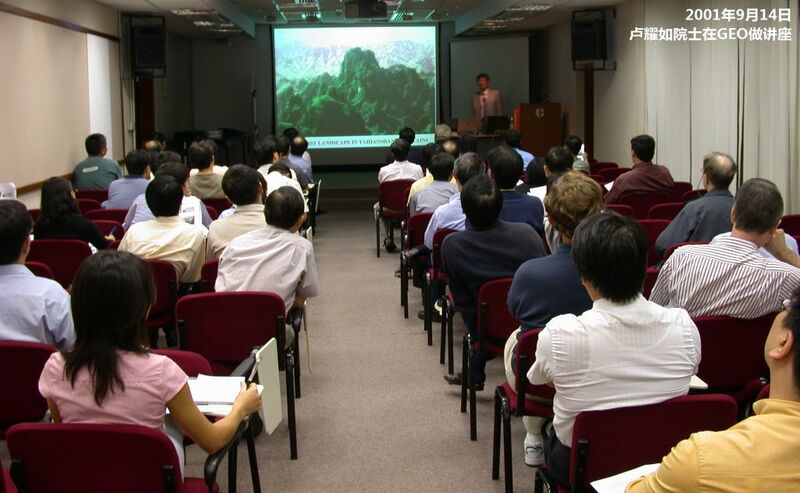 Treatments of Karst Geohazards and Geo-EcologicalImpacts, at HKIE, on September 12, 2001. Analysis of the Results of In-situ Soil Nailing Test Projects, at HKU, on September 11, 2001. Terrain Subsidence and Low-angle Long Travel Distance Landslides Triggered by Seismic Slumping and "Liquefaction"of Loessial Soil Masses during Strong Earthquakes in Northwest China, at GEO, on September 14, 2001. Loess in China and Related Engineering Problems, at HKIE, on September 12, 2001. The Fourth Wave in the Development of Geotechnical Engineering, at HKU,on December 21, 2001. Development and Utilization of Urban Underground Space and Urban Future Space, at GEO, on December 19, 2001. The Fourth Wave in the Development of Geotechnical Engineering, at HKIE,on December 17, 2001. The Limit Analysis for Slopes: Theory, Methods and Applications, at HKU,on December 21, 2001. The Limit Analysis for Slopes: Theory, Methods and Applications, at GEO,on December 19, 2001. Lessons Learned from Slope Failures in China’s Water Resources Development, at HKIE, on December 17, 2001. Effects of Groundwater on Building Foundations in Beijing Area, at HKU,on June 4, 2002. 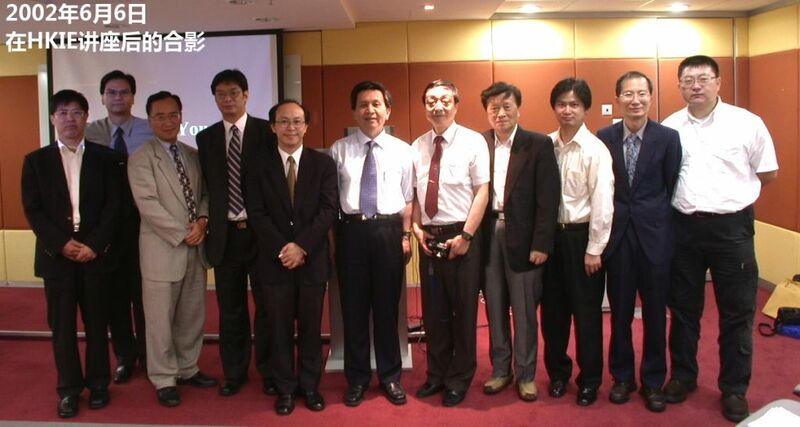 Introduction to the Status of GeotechnicalEngineering Codes in Mainland China, at GEO, on June 7, 2002. Geotechnical Engineering Problems and Developments Relevant to High-Rises in Beijing Area, at HKIE, on June 6, 2002. Variable Foundation Rigidity Design for Differential Settlement Reduction of Tall Buildings, at HKU, on June 4, 2002. Pile Group Behaviour and Relevant Regulations inthe National Standards Technical Code for Building Pile Foundations (JGJ94-94), at GEO, on June 7, 2002. New Technologies for Pile Foundation and Soil Improvement, at HKIE,on June 6, 2002. Analyzing Slope Stability by Finite Strength Reduction, at HKU, on December 10, 2002. Method of Analysis for Rock Pressure for Rock Slopes: Introduction of the National Standard Technical Code for Slope Engineering Works, at GEO, on December 12, 2002. Some Problems of Landslide Investigation in Chongqing Three-Gorges Reservoir Zone, at HKIE, on December 9, 2002. Principles of Construction Process Mechanics and Time-Space Effect of Stability for Underground Opening and Case Studies, at HKU, on December 10, 2002. Sensitivity Studies on Factors Influencing Slope Stability in Complex Ground Conditions and Case Studies, at GEO, on December 12, 2002. Excavation and Anchoring Effect and Deformation Monitoring of the Shiplock Slopes of the Three Gorges Project, at HKIE, on December 9, 2002.
Review of China Practices on Deep Excavations, at HKU, on June 24, 2003. Developments of Soil Mechanics and Foundation Engineering in Shanghai,at GEO, on June 26, 2003. Some Case Histories of Geotechnical Engineering in Shanghai Region, atHKIE, on June 27, 2003. Multi-Channel Transient Surface Wave Technology, at HKU, on June 24, 2003. Present Development and Future Direction ofGeophysical Techniques in Geotechnical Engineering, at GEO, on June 26, 2003. SWS Geophysical Technology used in Slope Exploration, at HKIE,on June 27, 2003. Registration of Geotechnical Engineers in MainlandChina, at HKU, on December 16, 2003. Professional Registration of Geotechnical Engineersin Mainland China, at GEO, on December 18, 2003. 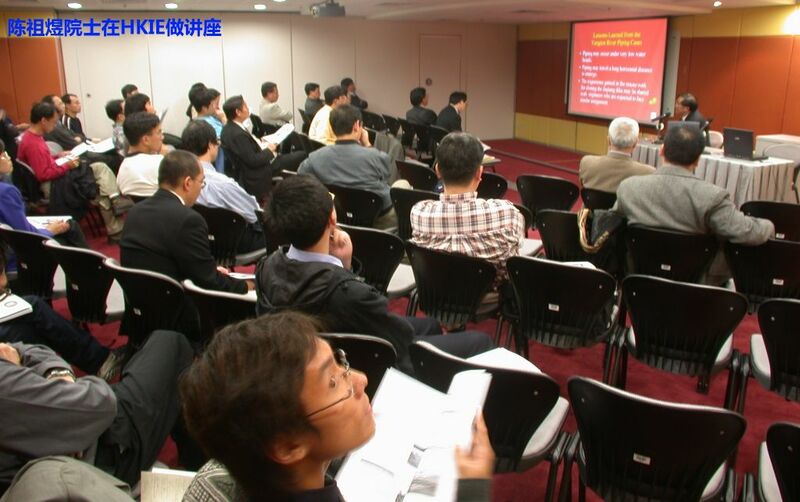 Discussions on National Examinations for Registration of Geotechnical Engineers in Mainland China, at HKIE, on December 17, 2003. Classification and Characteristics of Geotechnical Codes and Standards in Mainland China, at HKU, on December 16, 2003. History and Development of Geotechnical Codes and Standards in Mainland China, at GEO, on December 18, 2003. Current National Standards and Guides in Geotechnical Engineering and Related Professions, at HKIE, on December 17, 2003.